Have you ever read a banned book? What does Huckleberry Finn, Captain Underpants, The Great Gatsby, and To Kill a Mockingbird have in common? At some time, someone has tried banning these books from public and/or school libraries. Why are books banned? Most are banned for either religious insensitivities written in the book, and/or for political reasons. Some are banned due to cursing, morally offensive behavior such as homosexuality or violence. For example, The Great Gatsby is on the recommended reading list for most high schoolers and is listed as a great classic. However, back in its day of being published, it was quite the scandal. Reading banned books with your children gives you the opportunity to talk about the book, why they think it might have been banned and the real-life issues that face us today. Book Description: Banned due to offensive language. Winner of the 1977 Newbery Medal, this is a remarkably moving novel, one that has impressed the hearts and minds of millions of readers. Set in Mississippi at the height of the Depression, it is the story of one family’s struggle to maintain their integrity, pride, and independence in the face of racism and social injustice. And, too, it is Cassie’s story–Cassie Logan, an independent girl who discovers over the course of an important year why having land of their own is so crucial to the Logan family, even as she learns to draw strength from her own sense of dignity and self-respect. Book Description: Banned because some parents thought it was ungodly for animals to talk. Since 1926, Winnie-the-Pooh and his friends—Piglet, Owl, Tigger, Kanga, Roo, and the ever doleful Eeyore—have endured as the unforgettable creations of A. A. Milne, who wrote two books of Pooh’s adventures for his son, Christopher Robin, and Ernest H. Shepard, who lovingly gave them shape through his iconic and beautiful illustrations. Book Description: Banned for foul language and violence. At the dawn of the next world war, a plane crashes on an uncharted island, stranding a group of schoolboys. At first, with no adult supervision, their freedom is something to celebrate. This far from civilization they can do anything they want. Anything. But as order collapses, as strange howls echo in the night, as terror begins its reign, the hope of adventure seems as far removed from reality as the hope of being rescued. Book Description: Yes, this book was banned in China in 1965. Book Description: Banned for sexual language. Anne Frank is a Jewish girl who has to go into hiding during World War Two to escape from the Nazis. Together with seven others, she hides in the secret annex at Prinsengracht 263 in Amsterdam. After more than two years in hiding, they are discovered and deported to concentration camps. Book Description: Banned because the police in this story are pigs. Sylvester can’t believe his luck when he finds a magic pebble that can make wishes come true. But when a lion jumps out at him on his way home, Sylvester is shocked into making a wish that has unexpected consequences. After overcoming a series of obstacles, Sylvester is eventually reunited with his loving family. Book Description: Banned in South Dakota, because of comments the characters made about Native Americans. This beloved story of a pioneer girl and her family begins in 1871 in a log cabin on the edge of the Big Woods of Wisconsin. Laura lives in the little house with her Pa, her Ma, her sisters Mary and Carrie, and their dog, Jack. Grab your FREE bookmarks to keep with you, so you know what books to watch for. Banned books remind us of the power of the written word. 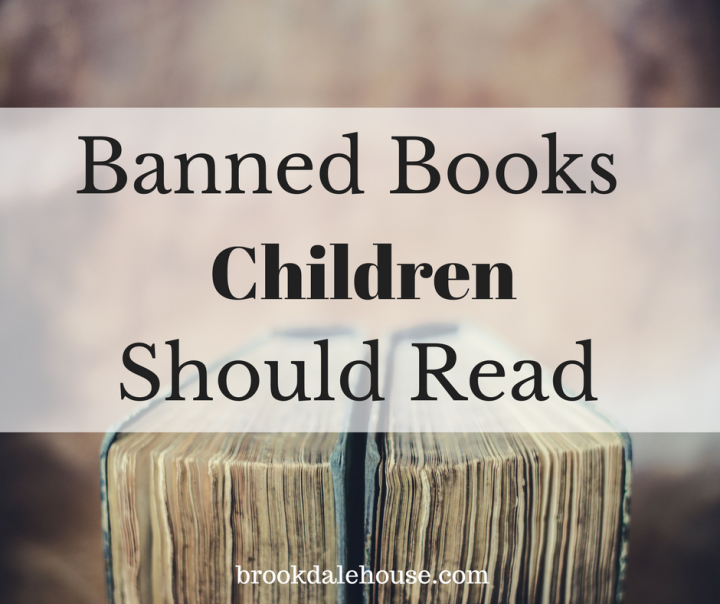 What banned books will you and your children be reading?